2008 is soon a wrap, and it’s time to update my list of the different diagnostic and cancer treatment videos I’ve filmed for the www.oncolex.no project over the last three and a half years. The stomach exposed through the midline incision. 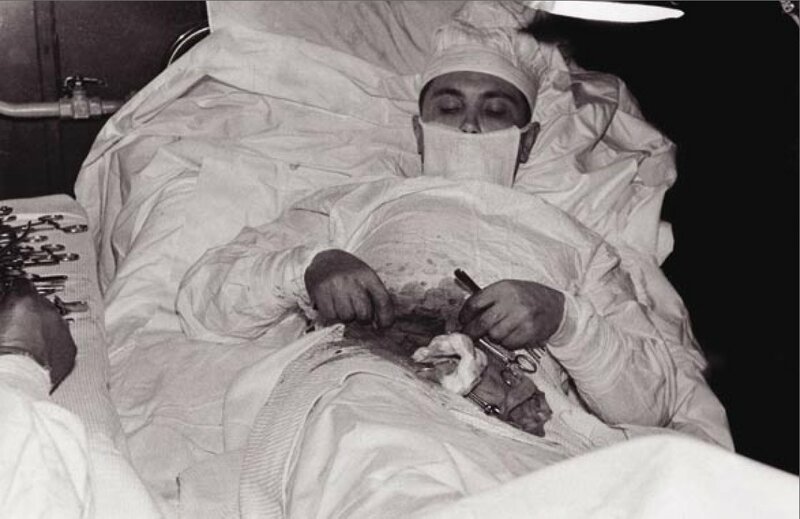 Dr. Leonid Rogozov performing an appendectomy on himself. I always thought the scene in the movie Master and Commander, where Dr. Stephen Maturin performs surgery to remove a bullet on himself, was a bit far-fetched. But it turns out that even in the field of self-surgery, reality surpasses fiction. As List Universe’s Top 10 list of self-surgeries shows, removing a bullet from your own abdomen is merely an outpatient procedure, compared to what have actually been done over the years. Thanks to T for the tip! The pump used to inflate the dilatation balloon. You are currently viewing the archives for December, 2008 at The Sterile Eye.